If you are reading this article, then the earth wasn’t swallowed up by a black hole when the LHC (Large Hadron Collider) was commissioned on September 10 in Geneva. An opportunity to lift the curtain on an aspect of the project that has received less media coverage but is no less spectacular: the vast test program that began in 2001 to check the hundreds of superconducting magnets that make up the LHC. The LHC at CERN in Geneva is by far the largest particle accelerator ever built. The prospects that it opens up are on a similar scale: in addition to hunting for the mysterious Higgs boson, it is expected to shed more light on the "dark matter" making up most of the universe and will explore the existence of new dimensions, in addition to the three we know... In the meantime, we still do not know what makes the world go round, but we do know exactly what makes the hadrons go round in their twin tubes buried 100 meters underground: thousands of magnets! "9548, to be precise", says Marco Buzio, responsible for magnetic measurements at the LHC. These magnets notably include 1232 cryodipoles (superconducting dipole magnets), each 15 m long and weighing 34 metric tons, which keep the particle beams on their circular path (bending magnets) with a nominal field of up to 8.3 T. These cryodipoles are distributed all around the circumference, alternating with 368 cryoquadrupoles, which are 3.12 m long and keep the beam focused. In addition to these two major types of magnet, which constitute the backbone of the acceleratorParticle accelerators were developed by physicists to study the elementary nature of matter. Nowadays, they are usually immense, highly international..., there is a wide variety of smaller superconducting or resistive magnets, many of which are multipoles: magnets to correct the main ones and the beam orbit, kicker magnets, splitter magnets, etc. But let’s get back to our 1232 cryodipoles. "The behavior of each magnet must be precisely known and validated in terms of geometry and integrated field, among other things, for each stage of operation from power rampingThe process of injecting current to bring the field up to the operational field. 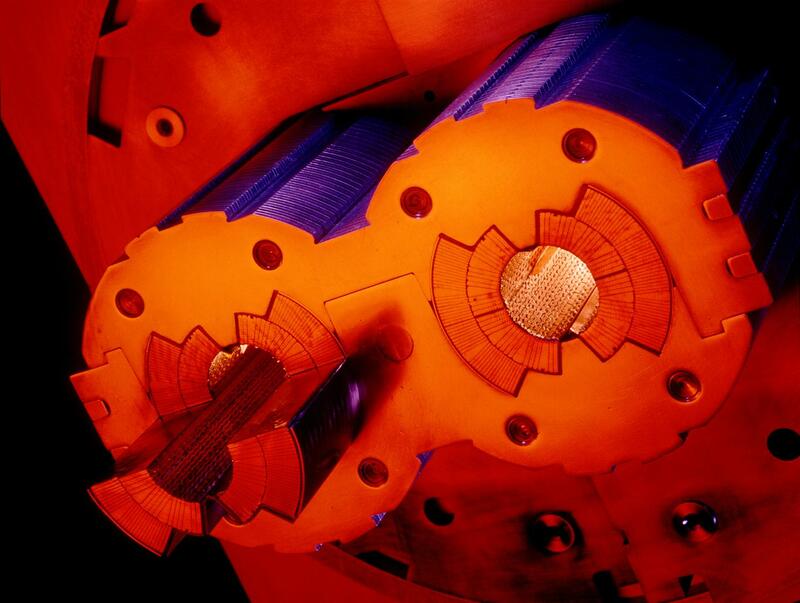 Used particularly for superconducting magnets.... to steady operating conditions,” explains Marco Buzio. “There is no room for mistakes: it takes six weeks to bring the temperature of the 40,000 metric ton facility down to 1.9°K, and the cost of any anomaly that arises in-situ is exorbitant!" Put simply, this was the biggest challenge ever in the fields of magnet construction and magnetic measurement. Calibrating these measuring coils and ascertaining their geometrical characteristics (radius, surface area) were crucial tasks, as one might imagine. Calibration was carried out using a reference magnet that had been very finely "mapped" using NMRNuclear Magnetic Resonance. A resonance phenomenon seen when you irradiate a sample in a magnetic field with an RF field..... In addition, NMRNuclear Magnetic Resonance. A resonance phenomenon seen when you irradiate a sample in a magnetic field with an RF field.... probes were used directly on several types of dipole for additional measurements – load curves, for instance. Hall effectA popular magnetometer technology, using a semiconductor plate. One injects current on one axis of the plate and measures a... sensors were also used – for quick checks in non-homogeneous magnetic fields, as well as for trackingOnce the resonance has been found (see Search), a continuous-wave NMR teslameter can lock onto a signal and continue measuring it, even... magnetic transients. Marco Buzio explains, "In total, each magnet represented five days’ work... when everything went as planned!" We could also tell you about the magnetic measurements taken with the LHC operating, to constantly correct the behavior of the various magnets and synchronize their action, but that is another (long) story. But it is worth noting that, to monitorSee Control. certain dynamic phenomena that delay stabilization of the field in normal conditions, CERN is working on a new type of rapid integratorThe part of a fluxmeter that integrates the voltage... – 10 rotations per second! We mention it in the news in brief section of this newsletter, and will cover it in greater detail in a future issue. Following on from the first models built in 1990 and the first 10 m long prototypes in 1997, full-scale production began in 2001, shared between France’s Alstom, Germany’s Babcock Noell and Italy’s Ansaldo. 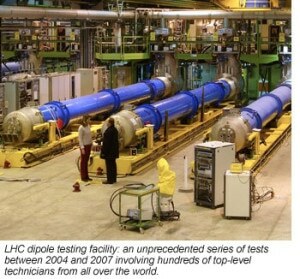 Each magnet was first tested "hot" at a few thousandths of the nominal field at the production sites, to detect any major faults, before being transported to CERN for an unprecedented series of tests between 2004 and 2007 involving hundreds of top-level technicians from all over the world. After a second "hot" round to test the assemblies from the electrical and mechanical points of view, the dipoles were cooled to cryogenic temperatures to undergo three types of test: power, magnetic and electrical. The power tests involved magnet "training": the power supply is increased by iterations to take the niobium-titanium winding – with 10% empty space – to its equilibrium position under the effect of the magnetic fields. "This process, which enables us to guarantee the magnet against quench risks during operation, is usually completed within 3 or 4 cycles,”explains Marco Buzio. “But some of the magnets gave us a hard time, requiring more than 10 iterations in some cases!"